The Rhinestone Cowboy could shred with anybody, and more people should know it. In the three weeks since country-music legend Glen Campbell died, some tributes have referred to him as “one of the greatest country guitarists.” It has the ring of hyperbole, the sort of thing you say about someone after he’s died and history takes a backseat to homage. But we’re here to tell you: It is true. Campbell wasn’t just a prolific writer of radio hits with a five-decade track record. He was a legit guitar god. Maybe, as you read the obituaries on Aug. 8, when he died at age 81, you thought to yourself, ”’Gentle on My Mind,’” much as I like it, doesn’t exactly make me think of Eric Clapton or Django Reinhardt.” Campbell’s persona, for many of us born after 1975 and not reared on Southern radio, was as a crooner with a mile-long list of catchy songs. Even knowing that he was a sought-after studio musician in the early 1960s before his solo career took off doesn’t quite square with the reality of hearing Campbell’s 1967 recording of “Gentle on My Mind,” which doesn’t even have a guitar solo (or a chorus, truth be told). Today, happily, we can go back and see it all with our own eyes: Glen Campbell was undoubtedly one of the greatest guitarists who ever lived, in any genre of popular music, and you’re going to enjoy discovering (or rediscovering) that fact thanks to these fantastic videos. First up, here’s a very young Campbell performing behind George Morgan on the old Star Route TV show in 1963. “My Window Faces the South,” an upbeat song with rockabilly leanings, opens with Campbell flying through some intro bars (that’s him bouncing uncontrollably in the background), then returns to him at 1:33 for a solo that has as much Chuck Berry in it as Chet Atkins. Campbell’s in his mid-20s here. He wouldn’t be playing behind the likes of George Morgan for much longer. Campbell often partnered with Roy Clark, another virtuoso, for some good ol’ fashioned guitar dueling. Here’s the two of them playing an instrumental version of “Ghost Rider in the Sky” on the old Hee Haw variety show. For a guy who never learned to read music, Campbell’s natural control on these kinds of duet scales is incredible. No one would confuse Glen Campbell with a blues guitarist, but this 1975 performance of Bill Withers’s “Ain’t No Sunshine” betrays all the hallmarks of an intuitive rock and blues player. Campbell was able to slip in and out of genres on guitar, from jazz to rock and blues in between—all with just his natural ability. Indeed, the jazz phrases in his playing are perhaps the most impressive element of his self-taught style. Finally, Campbell was known to play just about any stringed instrument, including five-string banjo and four-string mandolin, which of course have different standard tunings than a six-string guitar. 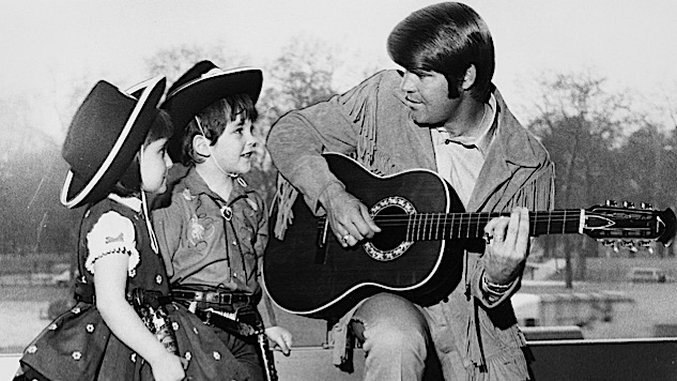 Here’s Campbell on his own late-’60s CBS variety show, Glen Campbell’s Goodtime Hour, playing a quick flash of banjo in a performance with once and future banjo superstars. Oh, and the guy second from right is actually Steve Martin, who was a 24-year-old, banjo-playing writer on Campbell’s show at the time.